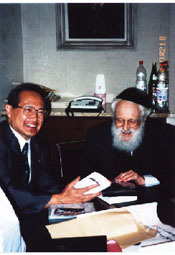 After leaving Romania for Switzerland, Rabbi Safran became the chief rabbi of Geneva in 1948. He was also professor of philosophy at the university there and published a number of literary works. Rabbi Safran was elected chief rabbi of Romania in 1940, when he was only 30. From April to August 1940, as a member of the Romanian Senate, he tried to persuade the military government of Ion Antonescu to moderate its anti-Jewish legislation. After the authorities ordered the dissolution of all Jewish organizations in December 1941, Rabbi Safran helped set up the Jewish Council, an underground organization that included all sectors of the Jewish population. His home became the group’s meeting place. The council used its links with Romanian church officials, the Vatican and the royal family in an effort to prevent the mass deportation of Romania’s Jews to the Nazi extermination camps. Rabbi David Dalin notes on page 14 of his book, The Myth of Hitler's Pope, that Pope Pius XII was praised by Rabbi Safran for his efforts to save Jews during the Holocaust – efforts, one can see, Rabbi Safran had personal knowledge of. Just another bit of information that helps prove that DovBear is mistaken on this issue.